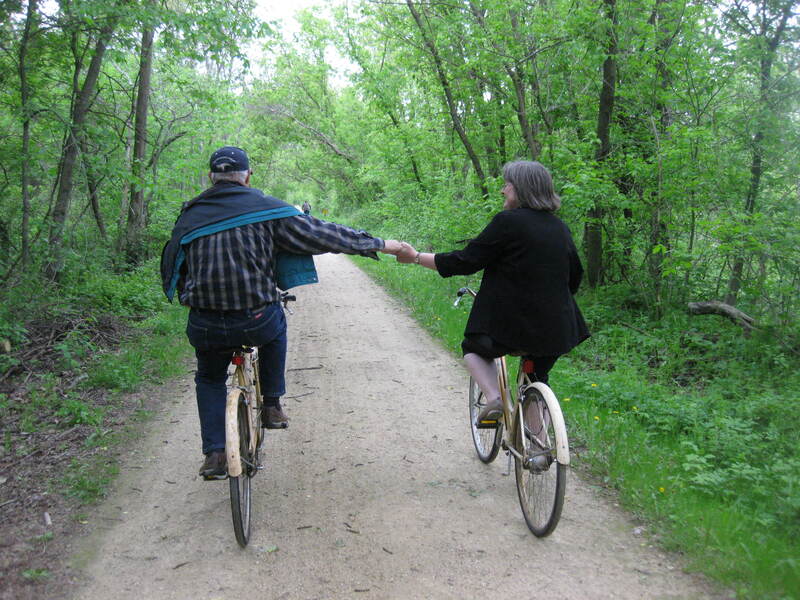 Nan and Bill of El Paso, Illinois getting ready to experience the beauty of the Elroy-Sparta State Trail. In spite of a few showers from time to time, the weather has been some of the best for bikers who want to experience the Elroy-Sparta State Trail. The trail spans 32 miles between the towns of Elroy and Sparta on the abandoned Chicago & North Western Railroad bed. Traveling from Elroy to Sparta will bring you through the towns of Kendall, which is the trail headquarters of the Elroy-Sparta State Trail; Wilton, which is the heart of the Elroy-Sparta State Trail and Norwalk. Along the way you will observe wetlands, prairies, farms and un-glaciated areas since the trail is located in the northern Driftless Area of Wisconsin. The highlights of the trail are the three rock tunnels. Two of the tunnels are approximately ¼ mile long. These two tunnels are located between Kendall/Wilton and Wilton/Norwalk. The tunnel located between Norwalk and Sparta is ¾ of a mile long. For those biking enthusiasts that want to experience more of the area, there is an additional 68 miles of connected trails to the Elroy-Sparta State Trail. The “400” State Trail is a 22 mile trail located between the cities of Elroy and Reedsburg, Wisconsin. The La Crosse River State Trail is a 22 mile trail between the cities of Onalaska and Sparta, Wisconsin. The Great River State Trial is a 24 mile trail between Marshland and Onalaska, Wisconsin. 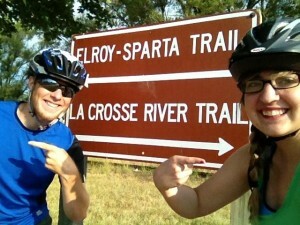 For more information about the Elroy-Sparta State Trail and maps of all 4 connected trails, visit www.bike4trails.com; www.elroy-sparta-trail.com; and http://dnr.wi.gov/topic/parks. Amil’s Inn Bed and Breakfast is located in the heart of the Elroy-Sparta State Trail and would be honored to have you as our guest as you enjoy the 4 trails of western Wisconsin. Biking enthusiasts, Paul and Rachel, deciding which biking trail to take! After a much cooler and wetter spring than normal, the weather has turned to be great biking weather. For biking enthusiasts, Western Wisconsin has 101 miles of connected biking magnificence! The 101 miles consists of the Great River State Trail, La Crosse River State Trail, Elroy-Sparta State Trail, and the “400 State Trail. The Great River State Trail is a 24 mile trail between Marshland and Onalaska, Wisconsin. This trail takes you through prairies and backwaters of the upper Mississippi River valley and will take you along 18 different waterways, cross over the Black River on a 287 foot former railroad trestle, follow along Lake Onalaska on the abandoned Chicago-Northwestern railroad line. The La Crosse River State Trail is a 22 mile trail between Onalaska and Sparta, Wisconsin. The trail lies in the La Crosse River valley and parallels an active rail line to the north of the trail. The trail was developed on the abandoned Chicago-Northwestern railroad line. You will pass over crystal clear trout streams and pass picturesque farms as you pass through the communities of La Crosse, West Salem, Bangor, Rockland and Sparta. 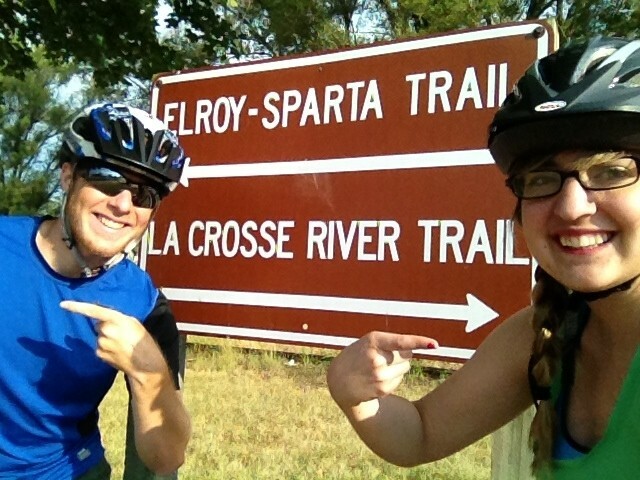 The Elroy-Sparta State Trail is a 32 mile trail between Sparta and Elroy, Wisconsin. It is the first ‘Rails-to-Trails’ bicycle trail in the United States and is one of the most popular trails in the country due to its 3 rock tunnels. The tunnel between Sparta and Norwalk is ¾ of a mile long. The tunnels between Norwalk and Wilton and Wilton and Kendall are ¼ mile long each. The trail passes through the communities of Norwalk, Wilton, Kendall, and Elroy. Along the way you will observe wetland, prairies, farms and unglaciated areas since this is located in the northern Driftless Area of Wisconsin. It also follows an abandoned Chicago-Northwestern railroad line. The “400” State Trail is a 22 mile trail between the cities of Elroy and Reedsburg, Wisconsin. The trail name was derived from the Chicago-Northwestern passenger train that traveled the 400 miles between Chicago and Minneapolis/St. Paul in 400 minutes. The trail crisscrosses the Baraboo River and one will be able to observe wetlands, wildlife, sandstone bluffs, rolling cropland and pasture. For more information on the 4 trails that make up the 101 miles of connected trails visit www.bike4trails.com and http://dnr.wi.gov/topic/parks/. I don’t know about you but I am ready for March 1. You may ask why March 1? The month of March usually gives us the 4 seasons which is a sure sign that winter 2010-2011 will soon be behind us! Before March 2011 is turned on the calendar, SPRING will officially be here. I personally LOVE spring. I love seeing everything come back to life. I love getting my hands dirty in the garden and breathing the fresh spring air!!! It must be the “you can take the boy out of the country but you can’t take the country out of the boy” syndrome. What has this to do with Bike 4 Trails! Wisconsin offers many miles of biking trails. Many of which are old railroad beds converted to biking trails. Since many of us are considering “staycations” instead of planning longer “vacations”, March is a great month to start planning and getting into shape for that biking staycation. Great River State Trail, La Crosse River State Trail, Elroy-Sparta State Trail and the “400” State Trail. The Great River State Trail runs from Marshland to Onalaska, Wisconsin; the La Crosse River State Trail runs from Onalaska to Sparta, Wisconsin; the Elroy-Sparta State Trail runs from Sparta to Elroy, Wisconsin; the “400” State Trail runs from Elroy to Reedsburg, Wisconsin. Visit www.bike4trails.com for more info and links to all trail websites. The trails will open May 1 and are open to October 31. State trail passes are required for all bikers 16 and older. Day passes as well as annual passes are available which are good on all Wisconsin State Trails. Bike passes are available at Amil’s Inn Bed and Breakfast. Amil’s Inn Bed and Breakfast which is located in the heart of the Elroy-Sparta State Trail would be honored to have you as guests and assist you with making your staycations plans for the Spring, Summer and Fall 2011 seasons. You may even find your Innkeepers on one of the trails holding hands!!!!! !